Hotter Shoes at Shoes International. Orders include FREE UK DELIVERY! Men's & Women's Shoes, Sandals, Slippers, Walking Boots & more! Hotter Shoes UK have been making comfortable shoes for women and men since 1959 and have invested millions of pounds in their factory based in Lancashire to become one of the most advanced shoe manufacturers in the world. They began by manufacturing slippers – a type of footwear designed almost exclusively with comfort in mind – before bringing this concept of comfort as a priority to other types of footwear. Not only are they advanced but they are also extremely popular. 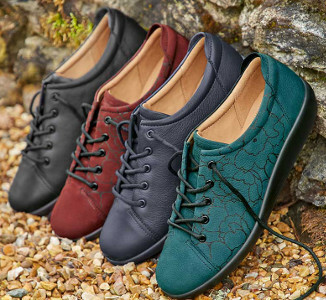 In fact, they make more shoes in the UK than any other manufacturer – the entire comfort concept range is made in Lancashire, allowing them unparalleled control of the materials, production and quality control of their footwear. All of which means a comfier, higher quality pair of shoes for you. Hotter have always put comfort first. Their philosophy has always been to utilise the finest quality of components - culminating in the 'Comfort Concept' range. 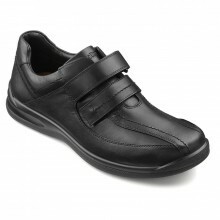 Customers worldwide enjoy the high quality finishes, breathable leathers, flexible soles and lightweight designs. Every customer remembers that first 'Hotter Moment' - that feeling of sinking your feet into soft cushioned comfort. Their customers wanted this feeling of supreme comfort across all their footwear, which lead to the launch of a range of heels. Hotter provide a wide range of styles to ensure all your wardrobe needs are met, from slippers and comfort casuals through to their fabulous new range of heels – which are now in stock! Every order comes with our famous price match promise and Free Delivery in the UK! We're currently expanding our range of Hotter shoes, sandals & boots to bring you all your favourite designs and styles in Mens and Womens footwear ranges.